This is a book about the big questions in life: knowledge, consciousness, fate, God, truth, goodness, justice. It is for anyone who believes there are big questions out there, but does not know how to approach them. 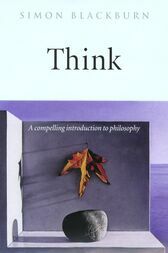 Think sets out to explain what they are and why they are important.Simon Blackburn begins by putting forward a convincing case for the study of philosophy and goes on to give the reader a sense of how the great historical figures such as Descartes, Hume, Kant, and Wittgenstein have approached its central themes. Each chapter explains a major issue, and gives the reader a self-contained guide through the problems that philosophers have studied. The large scope of topics covered range from scepticism, the self, mond and body, and freedom to ethics and thearguments surrounding the existence of God.Lively and approachable, this book is ideal for all those who want to learn how the basic techniques of thinking shape our existence.